The technique helps students develop critical thinking skills. 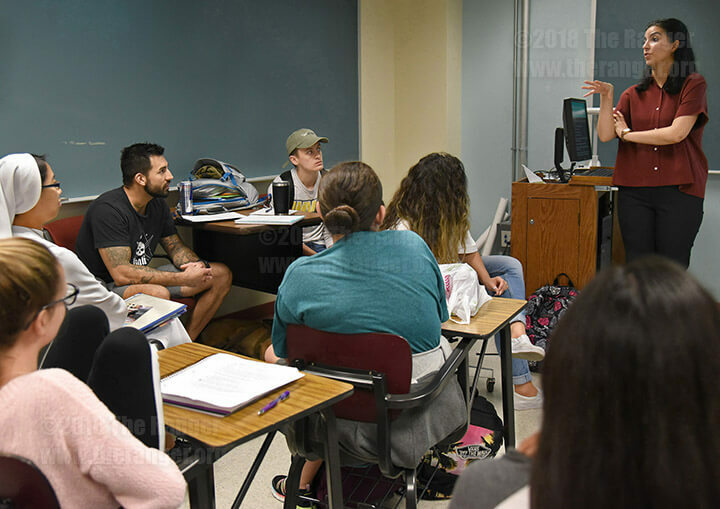 History Instructor Suraya Khan divided students into four groups for a mock scenario deciding America’s course of action during the Philippine War of Independence in a history class Sept. 25 in Chance Academic Center. The groups in HIST 1302, U.S. History 2, had to choose whether to negotiate the return of the Philippines to Spain, grant independence after a short transitional period with an American protectorate, grant independence but include an American naval base on the island, turn over the islands to a friendly power, govern the islands jointly or annex the Philippines as an American colony. Each group was provided a primary source for information to determine their decision. For example the Filipino perspective comes from a letter to the U.S. Congress from Emilio Aguinaldo, president of the Philippine Republic. The U.S. perspective comes from a publication in The North American Review “Imperialism and Christianity” by Rev. F.W. Farrar in September 1900. The groups represented the political and military perspective, economists, politicians and moralists and the Filipino perspective. Three of the four groups agreed to grant independence but with American possession of a naval base on the islands. This mirrored the actual outcomes. The fourth group decided the Philippines should be granted independence. “Every class comes to a different conclusion,” she said. History Coordinator Erik Anderson said this high-impact practice was the kind of teaching strategy the department was looking for when the college hired Khan in April. “I think it’s a good idea. It’s something that requires continued engagement,” he said. Anderson said the department will continue using innovative teaching techniques that encourage active learning. Khan said this method helps students think critically from a perspective different from their own.“The method is all about letting go of the heroic narrative and whitewashing of history,” she said. Khan said this technique unsettles the narrative that history is just a forgone conclusion and provides context on why events happened as they did. “Our background knowledge on the debates that are happening today is so limited, we don’t understand the situation for us to make actual effective policy,” she said. Khan was born and raised in Houston and grew up as a South Asian American after 9/11. “I’ve always been aware of issues surrounding race, class and gender,” she said. Khan, a first-generation college student, took basic courses at Lone Star Community College in 2006 in Houston. She received a doctorate in 2018 from Rice University, and this fall is her first semester of teaching. While at Lone Star, Khan said she had a professor who singled out Muslims. The professor told the class most Americans viewed Muslims as terrorists after 9/11 and passed around newspaper editorials indicating that view was widespread. “I don’t want students to feel unwelcome in my class,” she said. Khan said the role-play method gets students asking: Could history have gone differently?